For students and teachers alike, the end or beginning of a quarter or a series of 9 weeks means a chance to reflect on the old and a clean slate for the new. It makes sense in the classroom, so I plan to adopt this same mode of thinking for my life. 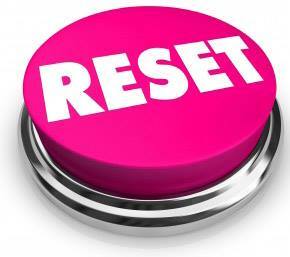 The new quarter is the perfect time for me or anyone for that matter to press the reset button. Taking the time to reflect on the first 3 months of the year is essential as it aids in the process of purposely moving forward. I for one like this approach because it helps me pinpoint which of the ideas (that have been rolling around in my head for the past 9 weeks) I need to focus my energy on. 2016 is a big year for us, one of our daughters is graduating from high school and our youngest one is entering kindergarten. Wow! It really doesn’t get any better than this. So while, there will be much to do to get us where we need to be by the close of the quarter, I have created an “April Reset List” to keep me both focused and inspired. Here’s how I plan to push my reset button this month, but feel free to join me. Who knows, maybe you need to press the reset button as well. Just click on the image, and it will enlarge. I have got some pretty interesting ideas. I plan to print out my Reset List and place it in my Happy Planner!